Responding to a need for a totally professional, trustworthy and responsive local property management provider, Guest Services has brought together a team of experienced maintenance, cleaning and communications specialists dedicated to delivering a superior service to home owners in the Knysna area. Your residence or holiday home is one of your most valuable assets - and investing in high quality management service will ensure it remains so. By undertaking scheduled inspections, maintenance and housekeeping regimes and carrying out emergency repairs, Guest Services will make sure your property is kept in optimum condition inside and out, all year round. Taking the time to get to know each owner and to understand each property, our holistic approach enables us to tailor our services to suit your individual requirements. In addition to cleaning, maintenance and security system checks, our added-value services include property improvements, emergency repairs, gardening, provisioning and a range of guest support and information resources  particularly helpful if you rent (or are considering renting) your home to visitors. 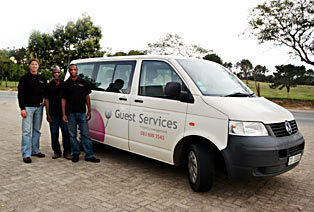 Guest Services Property Management Services operates a straightforward fee-based system. For a fixed rate of R1800 per month, owners of rental properties receive scheduled home inspections and regular email updates to confirm that all is well, or to advise on any maintenance or other issues. We also act as keyholders and the first-point of contact for security matters, take responsibility for property administration and any other day-to-day services that the owner may need. We also offer a range of additional services for which we charge a small commission. In addition to housekeeping services, such as cleaning, gardening and pool maintenance, we undertake property improvements, renovations and repairs, plus the purchasing of furniture, linens and household equipment, cleaning materials and provisions. We believe that good communication between service provider and client is the key to a lasting business relationship. To this end we have developed a simple and effective email update system to keep absentee owners informed of the services that have been performed and to advise on any maintenance, repair or other issues that may need to be addressed. Many property management companies claim to offer a professional service, but fall far short of client expectations. The difference is that, when Guest Services makes promises, we really do keep them! Property Management, housekeeping services and visitor attractions and activity advice. Rental of properties, short and long term, care of property in owner absence, organisation of maintenance, inspection visits and reports, inventories.